New York Rangers, end of an era? NOTE: 5-2 record (so far) in the first round. Well, the Rangers went out with a whimper, not a bang, in the 2016 Stanley Cup playoffs. They lost in five games to the hottest team in the NHL, the talent-laden Pittsburgh Penguins. As we look back over the last few years, and look forward to the future, the question has to be asked: Has this group of Rangers peaked as Stanley Cup contenders? IS IT ALL ABOUT THE GOALIE? For most of the history of the NHL, your team has always had a chance to win the Cup if they could just make the playoffs and have the hot goaltender lead them to the promised land. 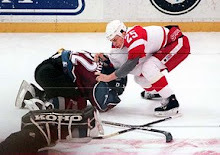 Unlike the NBA, where eighth seeds virtually never have a chance to win their first series, let alone a championship, the NHL (like it or not) gives that lower seed a chance when they ride the hot goalie and can even win a Cup coming from nowhere. Which brings us to Henrik Lundqvist. Still one of the best goalies in the world, he’s probably been in the top three or top five goaltenders for about a decade. He came on the NHL scene in the 2005-06 season as a guy who was fighting for a starting job. But after winning the gold medal for Sweden in February 2006, Lundqvist became an international star and, soon thereafter, an NHL star. Lundqvist, over the years, has been a supreme goaltender for the New York Rangers. But he’s put in a lot of years, a lot of time, a lot of games and, especially, a lot of high tension, close playoff games. Back in the 2013 playoffs, John Tortorella’s last year as the Ranger coach, Lundqvist put on a performance for the ages, shutting out the great offensive Washington Capitals in both games six and seven, which propelled them to a series against the Boston Bruins. Against the Bruins, I thought Lundqvist played great but the Rangers were eliminated in five games (see “If Your Goalie Stands on His Head and You Still Lose, Then What?” at SteveKallas.com, May 28, 2013). At the time, there was such frustration in Lundqvist’s voice (after the game 1 OT loss, Lundqvist famously said, “Can I score? No.”), there was a thought that he might not stick around long term as a Ranger. Of course, Tortorella wound up leaving and Lundqvist would eventually sign a long-term contract. The milder (certainly by comparison to Tortorella) Alain Vigneault came in and the Rangers made their run to the Cup Finals, only to lose to the much bigger and stronger LA Kings. In the 2014 run to the Cup Finals, the in-season acquisition of Martin St. Louis was the sniper the Rangers needed but didn’t have as he scored eight goals and seven assists for 15 ponts. But a year later, after having a poor season (and only one goal in the playoffs), St. Louis retired. Also, in 2014, the second leading goal scorer in the playoffs for the Rangers was the mercurial Carl Hagelin with seven goals. Today he’s gone (but not forgotten). Those two are no longer here and were the offensive keys to a Cup run. Has anyone taken their place? WHAT ABOUT THE “BELL CURVE” FOR THE NEW YORK RANGERS? Back on December 26, 2015, I was fortunate to do a sports talk shift on WFAN. During that time, I received a fascinating hockey call from Dante from Brooklyn, asking me if the Rangers had peaked in 2014. I told him that, much that I hoped I was wrong, I thought they had (for the full seven-minute call, go to SteveKallas.com and click on the 5 AM hour – it’s five minutes in and worth a listen). So you can look at the “bell curve” of the Rangers – lost in the conference semis to the Bruins in 2013, lost in the Cup Finals to the Kings in 2014, lost in the conference finals to the Lightning last year and lost to the Penguins in the first round this year. That’s not promising for next year, certainly if winning the Cup is your goal (which it always is). It says here Lundqvist is the guy. Offensively, the Rangers need a sniper, a guy who can score in the regular season and the playoffs. The biggest question mark, surprisingly, is on defense. Are they too old, too many miles, too many concussions, too many injuries? They need health and help. The King can do a lot. But he can’t do it all. Mini-Episode #720 features our 2016 NFL Draft preview with FDH Senior Editor Jason Jones. Here is Mini-Episode #719 of THE FDH LOUNGE, previewing Episode 2.10 of Better Call Saul. Mini-Episode #718 features a breakdown of the Sam Hinkie resignation with the Philadelphia 76ers with FDH Lounge Dignitary Joe Staszak of 97.5 FM The Fanatic in Philadelphia. Mini-Episode #717 features a breakdown of the 2016 Villanova basketball national championship with FDH Lounge Dignitary Joe Staszak of 97.5 FM The Fanatic in Philadelphia. Here is Mini-Episode #716 of THE FDH LOUNGE, previewing Episode 2.9 of Better Call Saul. Mini-Episode #715 features the program’s third conversation with legendary drummer Steve Smith. Here is Mini-Episode #714 of THE FDH LOUNGE, previewing Episode 2.8 of Better Call Saul. Mini-Episode #713 previews WrestleMania 32 with Evan Roberts of WFAN. Mini-Episode #712 previews the 2016 Final Four with Evan Roberts of WFAN. FDH Lounge Mini-Episode #711 reviews Season 4 of House of Cards. Here is Mini-Episode #710 of THE FDH LOUNGE, previewing Episode 2.7 of Better Call Saul. Mini-Episode #709 features analysis of the book VAN HALEN RISING: HOW A SOUTHERN CALIFORNIA BACKYARD PARTY BAND SAVED HEAVY METAL with its author, Greg Renoff. Here is Mini-Episode #708 of THE FDH LOUNGE, previewing Episode 2.6 of Better Call Saul. Mini-Episode #707 features a preview of the 2016 hoops tournament with FDH Lounge Dignitaries Nate Noy and Steve Kallas. Here is Mini-Episode #706 of THE FDH LOUNGE, previewing Episode 2.5 of Better Call Saul. Mini-Episode #705 features our analysis of the 2016 presidential primaries with Colin Delany of epolitics. Here is Mini-Episode #703 of THE FDH LOUNGE, the 2008 chapter in our Royal Rumble Anthology with FDH Lounge Dignitary Kyle Ross. Here is Mini-Episode #702 of THE FDH LOUNGE, previewing Episode 2.4 of Better Call Saul. Mini-Episode #701 features our review of the 2016 Oscars with fitness and pop culture expert John Basedow.